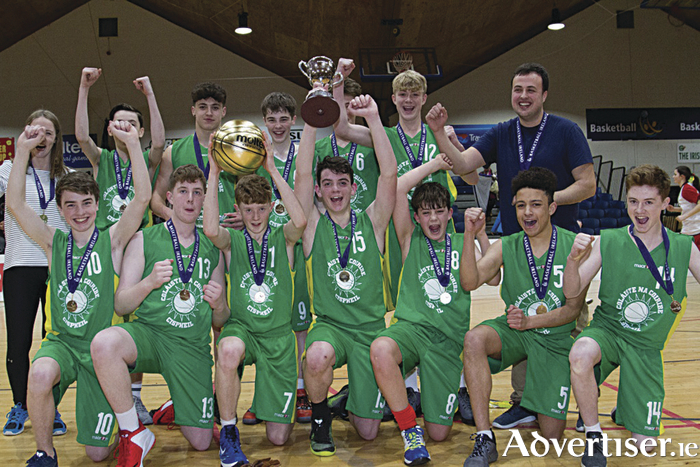 Galway's Colaiste na Coiribe received the reward they deserved for a superb season when they claimed the All Ireland Schools Under 16 C Boys League title, winnng out by eight over St Mary’s College, Dundalk. They were forced to battle hard, but having suffered the agonising loss of the Subway All Ireland Schools Cup final in January, losing by just one point to St Vincent’s Castleknock College, they made no mistake this time round. MPV Oisin Ó Gormaile was the shining star of this well-drilled Galway side, that had too much for them. They ledby 29-25 at half time, and in the end. Mac an Bhaird and Ó Conaighle also proved the difference as they held firm to run out 50-42 point winners. COLAISTE NA COIRIBE, GALWAY: Oisin Ó Gormaile (27 ), Conor Ó Bruada, Zak Rather, Máirtín Ó Conaighle (9 ), Cronan Mac an Bhaird (12 ), Eóin Ó Dómhnaill, Oisín Turley, Cathal Ó Maidín (2 ), Xav Ó Cléirigh, Ross Ó Nuallán, James MacLochlainn, Eoin Ó Fearchair.